So I thought I would put together a list of ways we play with household items. 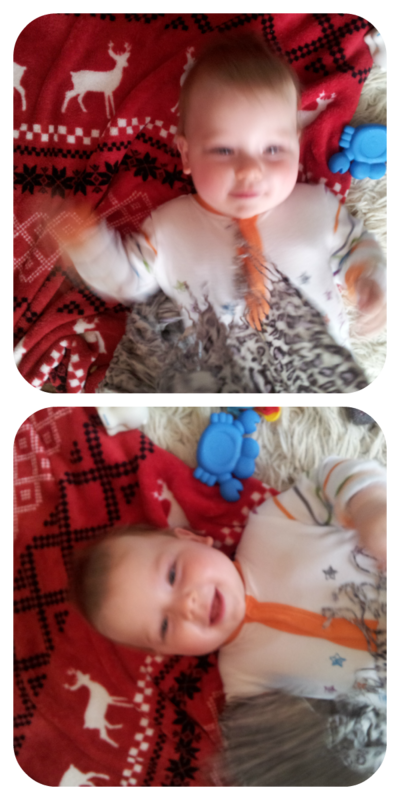 After a nappy change, I grab a scarf (I may have a little scarf shopping addiction) and run it over his body. As soon as I start to shake it I can see the excitement building up and he loves it going over his face, feeling the tassles stroke his skin. If you have a variety of scarfs, you can do it with different materials and tassle types. 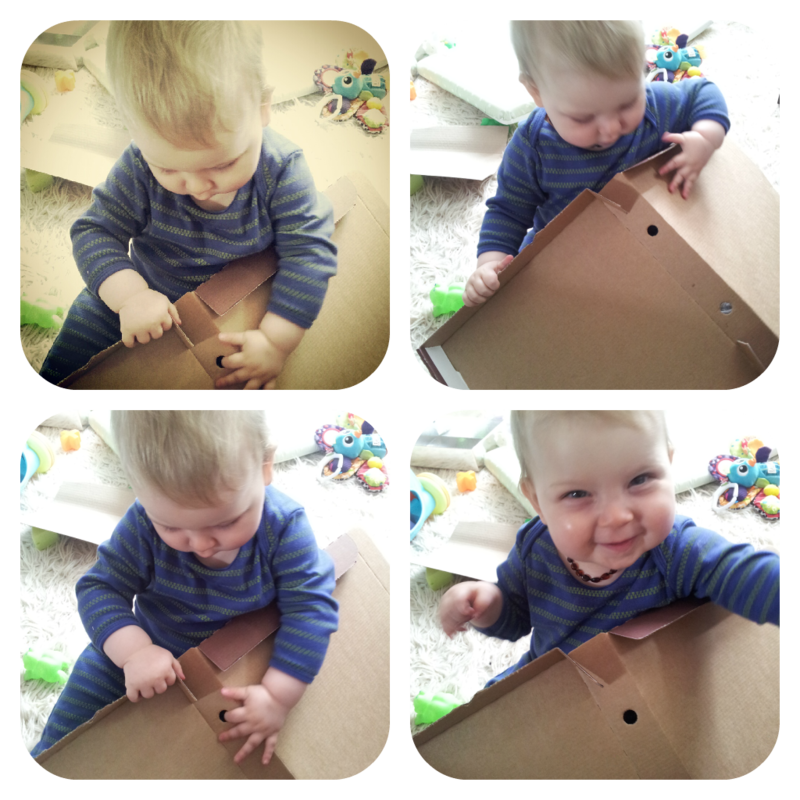 It never fails to get him squealing and giggling. I probably shouldn't be advising this, and obviously he must be supervised at all times, but he loves nothing more than sitting and crinkling a plastic Tesco shopping bag. He hits it, crunches it, pulls it and throws it. He could probably play with a bag all day and never get fed up, but we only do this when we are sat on the floor together. 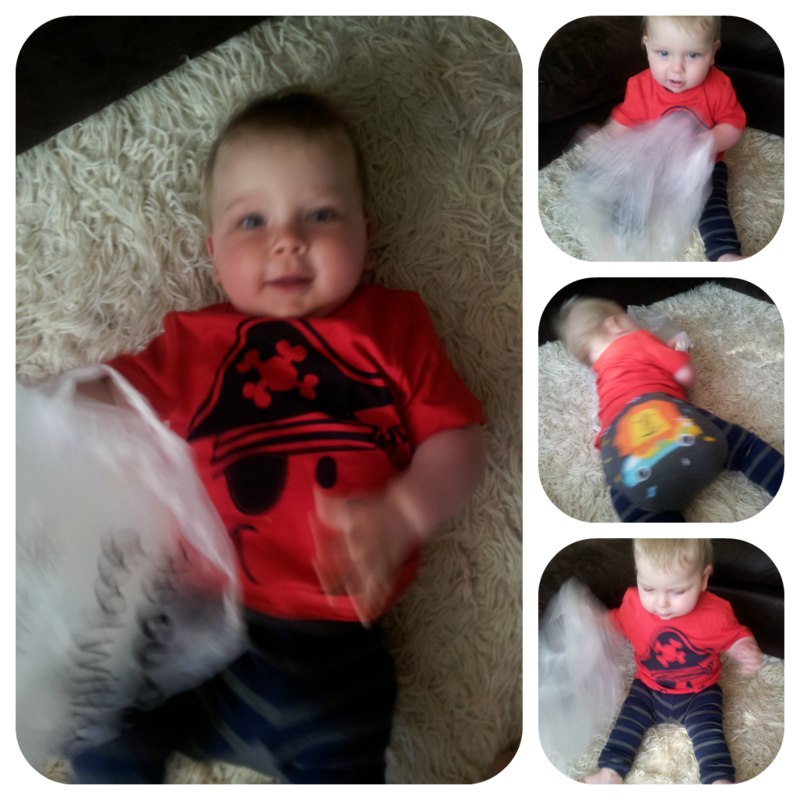 A disposable nappy bag works in just the same way. I found an old hanger, and tied pieces of ribbon and other random items I had lying around to it, making it into a mobile. He sits in his highchair below the door handle and plays with all the ribbons while I sort out his dinner in the kitchen. This doesn't have to be the massive box that you can make play houses from, any old box works fine. In this case, a pizza take-away box provided much fun as he explored it. He saw me munching the last slice and fancied having a look himself. Well I don't actually give him my phone, but when he starts reaching and grabbing at it, I quietly sneak the case off and give him that. So far he hasn't cottoned on that he is being fobbed off, as he looks so pleased with himself! Unfortunately this can back fire as he did lose my lovely devil case a few weeks ago. Better than losing my phone though! All children seem to love them and Dylan is not exception. He never manages to catch any, but loves trying to pop them. 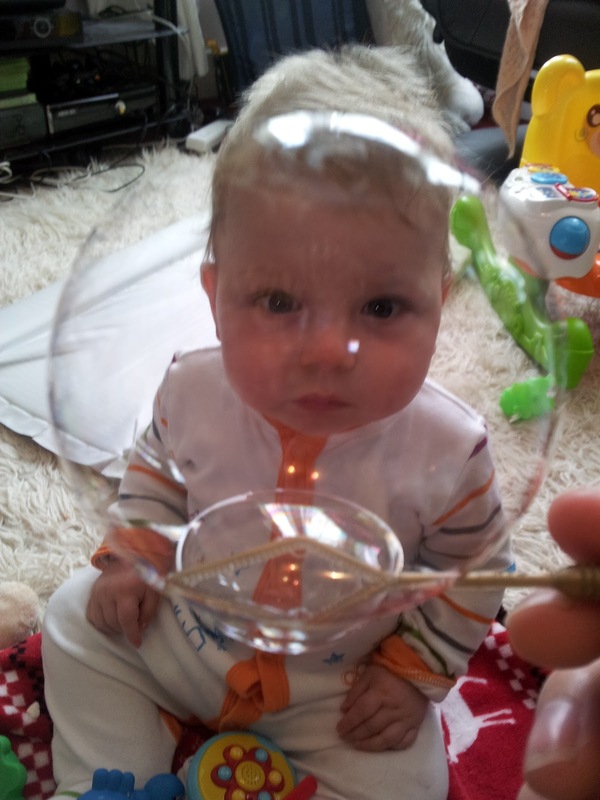 A tube of bubbles lasts months, and can be refilled with fairy liquid and water as many times as you like. Instant entertainment. So that is what the little dude and I get up to when we are bored of building blocks, teddies and shape sorters. Any other tips for easy and free toys? Hi great post some lovely ideas. A large deflated foil ballon is a good alternative to a plastic bag, also my little one loves those string of beads that you put on an Xmas tree there great for little hands. Wait til you have a 3 year old who says "I want to play with my phone" and knows how to work all the apps! They still adore cardboard boxes though! What a lovely idea for a post. I used to tie a knot in the centre of a carrier bag - so baby couldn't put his head in it. Nothing much changes as they get older. My six-year-old can spend hours playing with a stick he's found in the garden, or a collection of leaves or even a feather. He's got a great imagination. If you always encourage him to play and explore everyday items, your son will probably be the same. 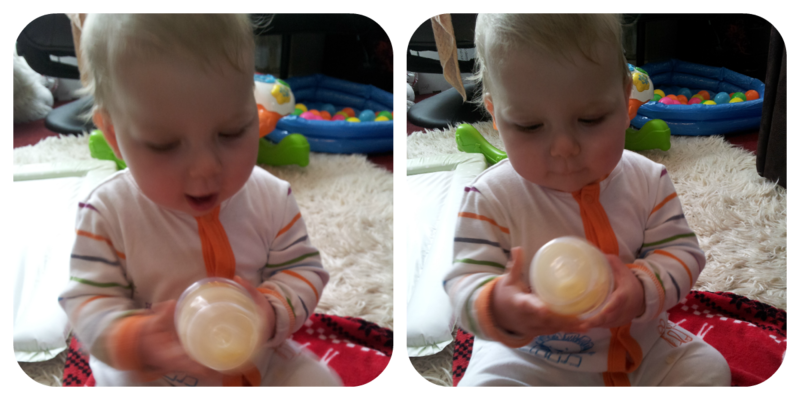 He does love to touch everything so I am hoping/ dreading that he will stay inquisitive. My boy loves the tin that treacle/syrup comes in, so if you do a lot of baking try keeping that - he bashes it with a teaspoon, puts bricks in and out of it and puts all sorts in and then shakes it to hear the different sounds - also a small metal dish and a tin that some tea came in. I agree, bottles of coloured water are good. There are so many things - kitchen utensils come in handy when I'm cooking - I can put him in his high chair and he'll entertain himself with a spatula! Ah this is a great post - I love the photos! 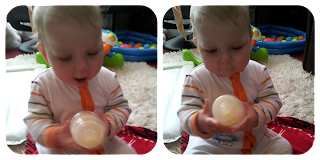 I'm going to try using a bottle as a shaker & see if my daughter is interested!